These days when I need something fast (but professional looking) I whip out my Cricut Maker to do the cutting part for me, like I did for this Halloween Unicorn Lantern. It’s another Craft Lightning project–meaning you can complete this whole project in 15 minutes or less. With a bit of hot glue to bring it all together, it’s super quick, and perfect for Halloween parties or trunk or treat trunks. Make them in groups for a great display! For my Bad Unicorn Trunk or Treat, I made them in all different sizes for the display. Affiliate links ahead. They cost you nothing, but help me keep the servers running! Speaking of hot glue–two of our fabulous Craft Lightning hostesses Angie Holden and Carolina Moore have recently published the book Hot Glue Hacks and Crafts. It’s everything you didn’t know you could make with hot glue and ONLY hot glue. Seriously, I even saw instructions on how to make a pair of flip flops from hot glue in this book! Definitely worth a look. Unicorns are so the rage with little girls. And this trend shows no sign of dying down. We’re going to make our unicorns Halloween worthy with a little hot glue and paper cut outs! Step 1. Open up the Halloween unicorn project file. If you are planning to use a 10-12 inch lantern, you can use the file as is. If you’re planning to use a larger size, you’ll want to enlarge the objects in the file accordingly. Cut all the pieces parts our with your Cricut machine in the appropriate colors. Step 2. Get out your hot glue gun! Roll the horn into a cone shape, then use a line of hot glue to make it keep its shape. Glue the left eyelash to the star. Glue the pink heart to the green heart. Curve the rounded edges of the heart around so they meet and glue together. This makes the perfect little ear! Step 3. Hot glue the paper pieces to the green lantern. I made these fun “flowers” by wrapping the tubing around my fingers a few times, then tying off the middle with a short piece of tubing. Trim up the ends and you have the perfect little bauble for a Halloween unicorn! Use your hot glue gun to put those baubles on your lantern. But silk flowers work just as well if you are in a hurry! 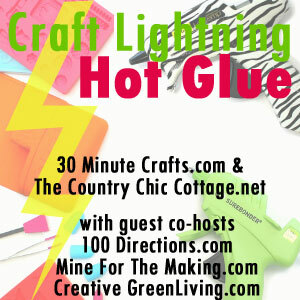 Want to see more hot glue projects? Check out the links below! Adorable! Thanks so much for joining in! Oh my gosh these unicorn lanterns are too cute!! Thank you for sharing with us at Merry Monday this week!